After 50 years of riding on the back of the Bullet, Royal Enfield has finally brought the Continental GT to Indian shores. We check if the new cafe racer is worth the dust it has raised. It's been over half a century since we got anything completely new from Royal Enfield. True, the Bullet family has seen the addition of quite a few members, and the Thunderbird came as a substantial upgrade, but - let's face it - they were all built on a similar chassis. Turning the tide is the Continental GT, which isn't even in the same ballpark as the Bullet or the Thunderbird. Going by exteriors, it is a flashback to the two-wheeler of the yesteryears - more specifically, the charming cafÃ© racers from the golden era of British motorcycle rallies. But look beyond the long polished tank, seat, bum-stop and the retro paint job, and you catch a glimpse of a modern speed demon capable of taking you as fast as 140 km per hour. You might want to ride slowly for a bit, though - enough to let the others on the road admire the motorcycle's exquisite tinted bar-end mirrors, its megaphone exhaust, and the aluminium-spoke wheels shod with Pirelli Sport Demon tyres. Don't let the clocks fool you into thinking that they are classic Smith gauges; the equipment is as electric as it gets. However, it's only upon mounting the GT that you feel the stallion heart pulsating within. For one, the riding posture is more of a crouch than upright - indicating that the motorcycle is a racer, not an easygoing cruiser. Touch the starter button lightly and the vehicle's 535cc engine explodes into life, barely revealing that it's the same 500cc single-cylinder unit of the Enfield that's been out-bored to displace an additional 35cc. Enhancing the ride quality of the motorcycle is the meaty note from the megaphone exhaust and the throbbing heart under the seat. 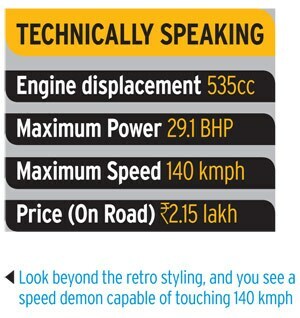 Look beyond the retro styling, and you see a speed demon capable of touching 140 kmph. What else? The GT drops the traditional carburettor to make room for a modern fuel injection system from Keihin. The light clutch and five-speed gearbox ensure good rideability, making it feel comfortable on the roughest of roads. However, fast as the speedometer needle of the GT hits 80, its journey to the crucial 100-kmph mark is fraught with vibrations of protest lodged through the handlebar and foot pegs. Its robust engine - nevertheless - stands by you through it all. The handling characteristic of the GT is, for its part, impressive. Unlike any other motorcycle from the Enfield stable, the chassis developed by Harris Performance gives the motorcycle considerable dynamic stability - something that finds apt reflection in its agility while turning corners. But the ride seems to be on the stiffer side, despite the Paioli gas-charged dampers mounted on its box-section swingarms. The GT comes with Brembo disc kits at both ends, which proves effective in bringing the motorcycle to a sudden halt even while speeding. The rear brake, however, could have done with more feel. 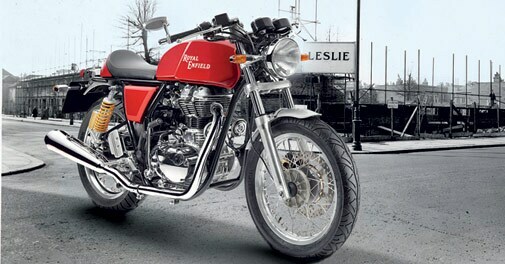 In all, the Royal Enfield has covered new ground by developing this motorcycle. The winds of change are blowing, so get ready to be swept away.